New Scottish Rugby chairman Sir Moir Lockhead has vowed to fill the empty seats that have plagued Murrayfield in recent years as part of a new commercial drive. 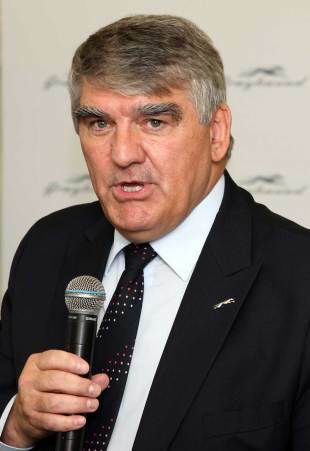 Lockhead, the former chief executive of UK transport company FirstGroup, officially took on his new role at the union's annual general meeting at Murrayfield on Saturday and immediately set his sights on increasing attendances throughout the Scottish game. "That will be the real shift. I would describe it as more entrepreneurial," Lockhead told The Daily Telegraph. "Supporters have to feel that they want to come here, that they want to participate, that they are welcome and that they view this as great entertainment and a great experience. I'm not yet clear on how we're going to do that, but I think there are things we can do. "There are things that supporters have said to me that we could do. There are quick wins that we would like to look at, and there are things that would take a bit more time. But as long as we seem to be starting to move then I think the supporters will think, yes, we're on a new trajectory and let's go for it." The new chairman's arrival, following the retirement of Allan Munro, was widely interpreted as the reason behind former SRU chief executive Gordon McKie's sudden departure, but Lockhead went onto praise McKie, who managed to reduce the SRU's overdraft by £5m. However, Lockhead's arrival is reportedly set to trigger a change in policy and mentality. The newspaper reports that Scottish Rugby are likely to scrap their policy of refusing to sell international tickets on match days, something which McKie supported vigorously. Lockhead is also believed to be looking into giving the Scottish pro sides, Glasgow and Edinburgh, more autonomy and the chance to develop away from the union. "There's a good argument for a bit more delegation to create an environment where the teams are generating their own support and they're getting their own people in," Lockhead said.